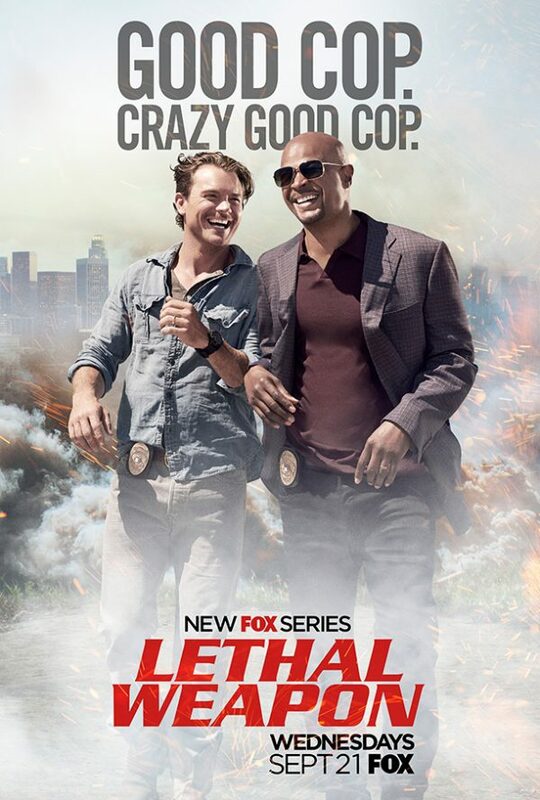 Roger Murtagh (Damon Wayans) is a good cop, trying to keep a low stress level in his life but then he’s partnered with Martin Riggs (Clayne Crawford) a slightly unhinged cop who doesn’t really have anything left to lose so throws himself into dangerous situations. They’re an unlikely duo but they make it work. The great thing about Lethal Weapon is the characters and their relationships. As the series progresses Riggs and Murtagh learn how to work together and even start to care about each other. They cause destruction almost everywhere they go but they end up getting the bad guy so it kind of works out in the end. The supporting cast is great too. Brooks Avery (Kevin Rahm) is the police Captain and I love how the show doesn’t make him incompetent just so it can have a couple of often reckless heroes. He’s Murtagh’s former partner so they know each other really well and there’s interesting dynamics now he’s Murtagh’s boss. Other recurring characters in the police department are Scorsese (Jonathan Fernandez) the pathologist and forensic technician, Detectives Sonya Bailey (Michelle Mitchenor) and Alejandro Cruz (Richard Cabral), and police psychologist Dr Maureen Cahill (Jordana Brewster). All of them are interesting characters and Cahill gets the most development besides Avery. The other major supporting character is Trish (Keesha Sharp) Murtagh’s wife. She’s her own kind of badass as she’s an amazing lawyer and takes Riggs into her home with no reservations. Yes, the crime that needs to be solved each week is usually a murder (and a lot of women tend to be scantily clad and/or end up dead) but there is a story arc throughout the series focusing on drug cartels and Riggs’ past. The show blends crime drama with both action and comedy almost seamlessly – it’s one of those shows that’s a fun, easy-watch but still pulls you in and gets you attached to the characters. The show is a lot of fun. It’s entertaining in a sometimes over the top way, and the banter between Riggs and Murtagh is laugh out loud funny. To be honest, there was not one episode that didn’t either make me laugh or at least smile. Both Riggs and Murtagh are very quick witted and also smart and it’s always nice watching competent people do their job. The Lethal Weapon TV show is inspired by the film series of the same name so that may put some people off because you know, we all hate reboots. I don’t have any attachment to the film series (I watched the first film as a part of my Uni degree but can’t remember much about it) and I feel the TV show is super fun and engaging so even if you are a film fan, you should at least give the first couple of episodes a go. I’m happy it’s been announced there’s going to be a second season. While it is mostly a villain-of-the-week kind of show, there are some character and plot threads that have been left hanging. I’m looking forward to seeing where the show and characters go next and as long as it keeps its sense of fun in amongst the emotional drama, I’m sure I’ll continue to love it.